I love summer and stone fruit! The orchard near my house sells a variety of plums, and these Louse plums are just a treat! You could also use some black doris or any free stone plums for this recipe. Preheat the oven to 175°C. Line a 12-muffin tray with cupcakes paper cups. Melt the butter in a jug, either in the microwave or in the oven (while the oven is warming up for the cupcakes). Place the eggs and sugar in a mixing bowl and whisk, using an electric beater, until the mixture looks light and pale yellow in colour. Slowly add the melted butter and the lemon zest. Keep beating at a low speed now; add half of the flour followed by half of the milk. Add the rest of the flour and milk and keep beating making sure that there are no lumps. In the meantime wash the plums and cut into quarters (or halves, depending on the size). Divide the mixture between the 12-cupcake cases and top each cupcake with a slice of plum, skin facing up. Bake for about 18-20 minutes, until golden brown at the top. You can also check by inserting a toothpick into the cupcakes: if it comes out clean the cupcakes are ready. Remove the cupcakes from the tin and let them cool down. 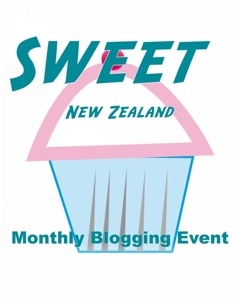 This recipe is for Sweet New Zealand, the sweet monthly blogging event for Kiwi Bloggers, this month of February 2013 hosted by Michelle from the blog Greedybread. Che belli questi muffin e che bello il colore di quelle prugne, hanno racchiuso i raggi del sole! Ciao cara!!!! spero tu stia bene!!!! Amo anche io l'estate con tutto il cuore e la desidero come non mai.. che ventata di sole mi hai portato con queste delizie, amica mia! Che voglia mi hai messo, in questo lungo inverno!! <3 TVB! Spero che l'inverno finisca presto allora! Dai che tra un po' è marzo! This is perfect for summer but... here in Italy it's still winter... brrr, that cold!!! Il colore delle prugne è fantastico, e sembra che facciano l'occhiolino dai muffin!! che sapori solari, grazie per questo raggio di sole, dolce e fragrante ! Un abbraccio ! How beautiful! And I bet these are very tasty. Compliments on your very lovely site. I have come to you via Chiara Gilgio and her Google recommendation. I will surely be back for more! I love those Luisa plums - they've been very plentiful down here this year, and I just made a whole lot into jam. Love the idea of putting them into cupcakes though.